The Post-Secondary Program (PSP) provides transition planning and training in independent living skills and employability. Some PSP participants prepare for college through experiences at the local community college. This program, offered in partnership with the Texas Workforce Commission/Division for Blind Services, provides training for students who are legally blind and have a regular State Board of Education high school diploma or GED. organization skills including print papers, personal information, etc. PSP participants are required to volunteer at least 100 hours during their stay in the PSP apartments. This requirement is in addition to attending classes at Criss Cole Rehabilitation Center and, sometimes, at Austin Community College. Description: The EXIT and Post-Secondary Programs at TSBVI serve 18-22 year old adults who are blind or visually impaired. 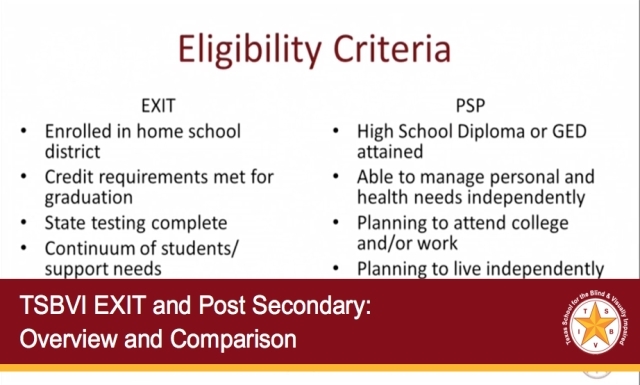 Assistant Principal for EXIT, Tad Doezema, and former Post-Secondary Coordinator, Linda Locke, provide a side-by-side comparison of the two programs in order to help professionals and family members determine which program is most appropriate for their student or child.